Explore these 80 product recommendations for your registry and new home. 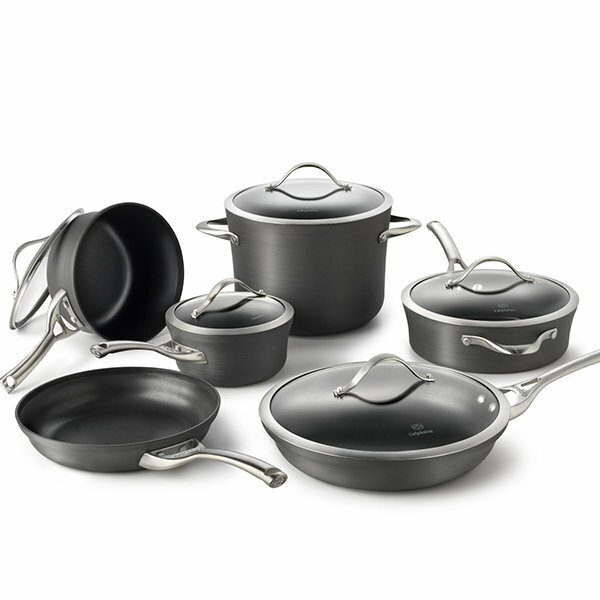 Dishwasher safe for easy cleanup, the Calphalon Contemporary Nonstick 11-pc. Cookware Set is hard-anodized and created with multi-layer nonstick for ultra-durability. This updated kitchen classic enhances the cooking process by evenly distributing heat and locking in the optimal amount of moisture. It features ergonomic handles and an advanced interior enamel that resists chipping and cleans easily. Features a perforated design for fast and thorough straining and soft, non-slip, elevated handles for a firm, comfortable grip. The large, 6-quart capacity of this pot gives noodles room to boil, and the 4-quart insert allows you to drain excess liquid without the need for a strainer. With 10 speeds, the standmixer will quickly become your kitchen’s culinary center as you mix, knead and whip ingredients with ease. Choose from over 20 different colors. This 1800 watt oven offers Toast, Bagel, Bake and Broil functions. Always Even™ Shade Control monitors the temperature and adjusts the timing to consistently toast to the shade selected every time! The K250 Coffee Maker allows you to brew a 4-cup carafe along with the same ease and convenience of brewing a single-serve cup — all at the touch of a button. The Nutri Ninja blender with Auto-iQ™ technology takes the guesswork out of making drinks! Programming combines unique, timed pulsing, blending and pausing patterns that do the work for you. The Simply Calphalon Nonstick Bakeware 6-pc. Set has the essential baking pans you need for your kitchen, including pieces for baking cakes, cookies, bread, and more. This bakeware set is made of a durable stoneware material and includes one each: 2.5-qt round with glass & plastic covers, 1.5-qt round with glass & plastic covers, 16-oz round with plastic cover & two 4-oz ramekins. Prep work is now easier with these nesting mixing bowls. They're made of durable non-porous porcelain to stand up utensils of all types. A great addition to any kitchen, this clear glass set lets you easily keep an eye on how your cakes, breads, casseroles and more are cooking up. Knives stay sharp for a lifetime with the Calphalon Precision Self-Sharpening 15-pc. Cutlery Set. The block has built-in SharpIN™ Technology to sharpen knives with every use. This 8-piece steak knife set is made of durable, corrosion-resistant, stainless steel handles and serrated cutting edge blades that never need sharpening. Knives in this Gibson 4-Piece Ceramic Blade Cutlery Set feature an extremely hard, very sharp blade which will never rust or get dull under normal use. Ceramic construction is hygienic, food safe and easy to clean. These knives are corrosion-resistant and crafted from premium-quality Japanese steel for exceptional slicing and cutting. This set includes one of each: slotted spoon, basting spoon, turner, slotted turner, spoon/spatula, spatula/scraper, peeler, pizza cutter, can opener, 4-piece measuring cup set and a 4-piece measuring spoon set. These bamboo cutting boards are perfect for every food prep need from slicing meat to chopping veggies and serving up appetizers to making cocktail garnishes. With beautiful chrome accents and elegant contours, the Deluxe Can Opener operates with a single-touch for effortless operation. The Power Cut® blade and magnetic lid holder are attached to the detachable lever for fast cleanup. The two pieces of the hourglass-shaped Hug Salt & Pepper Shakers fit together in a sweet embrace, making it easy to carry the pair to the table as if they were one. Ombré details featuring watercolor florals and stripes in a dramatic indigo hue. Chip-resistant, dishwasher and microwave safe with a Lifetime Breakage Replacement Program. The handcrafted rustic texture and antique style of Cucina makes it perfect for your casual table. Available in six colors: lavender (shown), mushroom brown, almond cream, pumpkin orange and cranberry red. Microwave, freezer and dishwasher safe. The true craftsmanship of Halo lies in the distinct design created by applying two reactive glazes which merge to achieve striking results, unique only to Denby. This all new collection blends sophistication with spontaneity, bringing a sense of tactile vitality to your table. Available in sand, grey, green, turquoise, ocean and purple. Casual luxe at its most versatile. Graduating shades of blue are finished with microwave safe gold banding. Dishwasher safe with a Lifetime Breakage Replacement Program. An expansion of the bestselling dinnerware bearing kate spade new york’s signature dot pattern, Larabee Road is now offered in gold dots and banded in gold. Bone china made in the U.S.A. with a chip-resistant technology and dishwasher safe convenience supported by a Lifetime Breakage Replacement Program. Swirling gold vines embedded in a field of midnight-blue shimmer like stars in the evening sky. Plates and accent pieces are available in a contrasting pure white background for mixing and matching. A wide, etched platinum/gold band with an inner band of delicate white florals over a whisper of dove grey. Odessa Gold, with a gold band, is also available. Sloping sides and triangular cutout handles add to the pleasing shape of this aluminum salad bowl. A simple yet lovely addition to any table setting. Not just dinnerware, Fiesta coordinates everything for entertaining. From striking textiles to ceramic servers, entertainment sets, platters, bowls and beverage servers to Tervis insulated tumblers and stainless flatware. This bowl on a pedestal elevates a table setting when filled with baubles or other objects as a charming centerpiece. Fine porcelain glazed by hand. An easy way of bringing a dash of festivity to everyday moments, and it’s just as easy to set the table of celebration around it. 5-piece place setting set made of black stainless steel. Delicate flowers outline this sculpted handle creating a timeless and elegant look. Clean, rounded handles with a polished gold finish have a distinctive flair and balanced proportions in this 20-piece flatware set. The set is dishwasher safe and never needs polishing. On trend Vintage flatware is the result of a special craftsman technique—an intentionally elegant “used” effect creating a romantic and ethereal feeling, typical of the shabby chic style. Make that special occasion sparkle with the Oleg Cassini Crystal Diamond Toasting Flutes. Glistening crystals embellish the Crystal Diamond flutes making the perfect gift for the happy couple or to celebrate any festive occasion. Craft beer enthusiasts will appreciate this four-piece set made from crystal. It includes specialty items such as IPA (India Pale Ale) and wheat beer glasses (designed to take on volume), as well as more versatile glasses (a nonic pint and tulip beer glass). Jazz up your glassware collection with party-ready options, including champagne flutes, double old-fashioned glasses, highballs, a pitcher and more. A stemless, easy-to-stack shape in durable crystal make this versatile set ideal for every day and casual entertaining. This 7-piece set includes six 9-1/2-ounce rocks glasses and one 33.75-ounce decanter with stopper. The Wine Enthusiast Wine Fridge holds up to 16 bottles of wine and keeps them cold using digital thermostatic control and a touch screen user interface. The set includes a shaker, strainer, bottle opener, corkscrew, jigger, ice tongs, and storage rack. This classic decanter set is a fun and useful touch for your new home together. Charter Club's budget-friendly yet high-quality sheet sets are constructed from 100% Pima Cotton (known for its softness and natural sheen) and are available in 12 pretty colors. Set includes flat sheet, fitted sheet and standard or king pillowcase. This Queen mattress topper features hypo-alergenic Microfiber Fill & Microfiber Cover. So soft & fluffy, you can’t even tell it’s not down! Lofty fill in three density choices gently cradles your head with the perfect amount of support for your sleep style. This comforter set features a striking paisley design in beautiful jacquard for an elegant and trendy look in your space. A delicate design at the borders of the French Perle shower curtain from Lenox lends added sophistication to your bathroom décor. This holder is made of brushed satin polished stainless steel for hygienic storage of up to four toothbrushes. If plush towels rank highly on your list of creature comforts, consider Royal Velvet towels, touted for their excellent absorbency and fluffy texture. They are made from Egyptian cotton and available in 14 different colors to match your bathroom décor. Get more storage space in your shower with the OXO Good Grips 3-Tier Shower Caddy. It easily holds shampoos, conditioners, soap, razors and more. This Dyson vacuum makes cleaning your floors easy with its fluid maneuverability and little resistance when advancing or turning the machine. It even captures microscopic particles including pollen, mold and bacteria and uses HEPA filtration. This handheld vacuum features Lithium Technology that delivers long run time and high power. Sleek design has a rotating slim nozzle with a built-in crevice tool and flip-up brush. Ideal for cleanup of dust, pet hair and crumbs. The Shark Professional Steam Pocket Mop featuring Intelligent Steam Contol™ offers superior cleaning and sanitation for all your hard floor surfaces. Iron smarter with the Maytag® Smartfill iron and vertical steamer. Remove everyday wrinkles with this innovative iron. Modular stacking system for optimal countertop and pantry organization with an airtight seal and pop-up button serves as handle to lift off lid. This compact rack has an interior wire tray for all your plates & bowls, plus hanging space for 3 small glasses & separate compartments for utensils. It features specially coated plastic drip trays that cause water to spread & dry faster & a fingerprint-proof stainless steel construction that stands up to the busyness of cleanup duty. This 7-piece set includes rectangular hamper, large storage basket, mini basket, magazine basket, upright toilet roll holder, media holder & waste basket. This wall-mounted pot rack is the perfect way to display and organize your cookware collection. Sleek and attractive, it adds a dramatic element to any kitchen décor. Cookware not included. Limited lifetime warranty. A burst of polished silvertone discs are attached to rods of polished metal to create this spectacular wall clock with a mirrored dial. This 8x10 picture frame crafted in Lenox-quality silver-plated metal with interlocking heart decoration is perfect for showcasing your wedding photos. The fashion-forward print on this upholstered ottoman makes a fun statement as a living room accent item or storage solution. These vases feature dazzling wedge cuts using both upright and cross cutting techniques for the utmost in sparkle and light refraction. This 3-piece set includes a 29-inch, 25-inch, 20-inch rolling suitcase with an add-a-bag strap to secure an extra bag for hands free carrying. Easy to carry on the shoulder or roll along at your side, this duffel is ready to go at a moment's notice. The rolling handle easily hides away when not in use and the bag opens to a spacious interior that includes luggage straps to keep everything in place. Strong yet extremely lightweight ABS/polycarbonate construction with 4 multidirectional spinner wheels for easy mobility—rolls upright so there is no weight on your arm or shoulder. This rolling garment bag makes it easy to have all the comforts and luxuries of home while you're away. Featuring quick-access exterior pockets, a spacious interior and two smooth-gliding wheels. Enjoy the warm embers of a soothing outdoor fire with the UniFlame Endless Summer Wood Burning Outdoor Fire Pit. Durable Airflow™ fire pit design utilizes a patent pending vent that draws in air for increased combustion and features a Copper finish. Plated-steel hinged cooking grate with built-in handle offers 363 square inches of cooking space. With the iON Tool Series iON16LM 40-V 16" Cordless Lawn Mower by Sun Joe®, you can ditch the gas, oil, and cords. Lawn mower utilizes advanced lithium-ion technology to deliver up to 40 minutes of whisper-quiet run time with zero carbon emissions. Whimsical floral designs and a soothing sand finish make this compact three-piece bistro set ideal to create a more intimate, cozy atmosphere in your garden. Enjoy incredible picture and dramatic detail with UHD. The 4K resolution means everything you watch looks 4x sharper than Full HD. It is a simplified smart TV with access to live programing, streaming content sources, and apps in one place with Smart Hub – and you only need one remote control for it all. Handy and versatile, the Coolpix AW130 is waterproof, shockproof and freezeproof so you can take it to the most extreme places with the knowledge that you'll get always get the finest quality photos and Full HD 1080p video. Built-in WiFi function lets you transfer files to a compatible smartphone or other device with ease. Plays all your music from Prime Music, Spotify, Pandora, iHeartRadio, TuneIn, and more. Fills the room with immersive, 360º omni-directional audio using hands-free convenience with voice-control. This deluxe tool set has everything you need for jobs around the home or in the garage. It includes popular tools for everyday needs, as well as a heavy duty plastic carry case for convenient storage and portability. The compact, lightweight design of this drill allows it to fit into tight areas and the high performance motor delivers 300 unit watts of power ability for a range of fastening and drilling applications. This step ladder combines an exceptional design with extremely lightweight, long-lasting aluminum construction for great stability and support. The top step height is 42' and it features deep non-skid steps, non-skid feet, and folds to 4" in thickness for storage. This screwdriver set includes the most commonly used sizes and each one is color-coded with ergonomic handles that make finding and using the correct screwdriver easy.